1 My child, listen to me and treasure my instructions. That is the cry from gold prospectors in north american cowboy/western films! The idea that there is gold in the hills occurred to me, but as a metaphor for looking for wisdom in the Bible. When someone goes looking for gold in the desert, or wilderness, they take supplies & tools with them. They ride or walk out into the wilderness & start looking for gold. It may take weeks, months or even years before they find what they are looking for. Or they may never find the gold. Prospectors recognise that it may take a long time to find what they are looking for. They have to be patient, self-reliant, persistent, not prone to giving up & positive in outlook. They wouldn’t be very successful if they went looking for gold in the hills, but turned around & came back having failed to find gold after only a day of looking! Yes, persistence & determination is called for. But what drives a prospector on, even after weeks or months of fruitless searching? I think it is the dream of “hitting the mother load.” Prospecting is like gambling in that way, & it is addictive for the same reason: perhaps today they will find a huge amount of gold… just over the next hill. Prospectors are convinced that there is gold to be discovered, they just have to search for it, & uncover it’s hiding place. The thought of finding the gold is what drives them on in their search. It is the dream of “hitting the mother load” which keeps prospectors in the hills. This frequent discover of God’s “gold” (His wisdom & words seemingly spoken directly to us) is especially true for the new Christian, whom God naturally wants to reward quickly & often, as they start to regularly read their Bible. God often seems to want to provide quick & ready answers to new Christians, both in terms of their prayer life & their new-found Bible reading habit. In the beginning of our faith journey with God, He often “speaks” to us in our most cursory Bible reading… the scripture seems to “jump off the page” at us & seems to apply to us & our particular needs frequently. Such treatment by our loving heavenly father naturally encourages us in our faith & increases our desire to pray & read our Bibles, which must surely be why God answers our naive, some-what egocentric prayers when we are starting out in Christianity! God is a God of love & encouragement, after all. Of course we need frequent encouragement, as a young Christian, to keep going back in prayer to God, & back to Him in Bible reading. But as we progress in our faith-walk, God is always seeking to deepen & broaden our faith & our understanding of Him. In order to do that, providing easy-to-find, simplistic answers may not be appropriate for us any more. As we grow older in the faith, our initial, more naive & simplistic views of God & Christianity often become rather inadequate, especially when they are challenged by our actual life experiences. We may find that our initial thoughts about the nature of God, Satan, evil & suffering, Bible truth, human nature, etc, etc, are no longer adequate to explain our experiences of life & how life works out. As we deepen our knowledge of God, through more diligent, patient searching of the Bible, God is able to explain finer, more subtle, deeper points to us, which we never would have understood as new Christians. In this sense, God is always deepening our relationship with Him, through our Bible reading. The Bible is a remarkable book (or collection of books, in fact) indeed it describes itself as being “living (alive) & active…” (*1.) In that context, many Christians have reported that they have read a particular passage in the Bible many times, & one day exactly the same scripture suddenly “leaps off the page” at them, in answer to a particular need, at that particular time. Even more remarkably, exactly the same passage can have slightly different interpretations, or multiple meanings, at different points in our maturing process. That one single passage can mean one thing to us in our earliest days as a new Christian, but take on a newer, deeper, more complex &/or complete meaning for us, as we mature in the faith. God is keen on us spending more time in our quest for the deeper, more subtle, more life-changing truths of the Bible. Some issues, such as evil & suffering, free-will & predestination, etc are simply too big, too complex, & too wide-ranging, to have a simple, pat answer. I don’t think it is easy to unearth this kind of subtle, divine wisdom, it takes much, much longer & is harder to unearth the subtler truths that God, through the Bible, has to offer. In this way, it may appear that God is with-holding the “gold” from us, but in truth, it is simply that our most urgent, important &/or significant questions do not have a simple answer. Clearly, such questions require an awful lot longer to discover answers to, if indeed they can even have adequate answers whilst we are “caught up” in time & space, in our physical, temporal lives, here on earth. Exhortation to a more thorough search for the “gold” of the Bible: meditation. Gold is precious because it is rare, & is therefore hard to find. Whenever someone delves into the Bible, they are trying to find the “gold” of wisdom & understanding contained within. Whilst we have seen that God readily provides us with His wisdom (via Bible reading & prayer) it nevertheless seems that in order to glean the very best, deepest, most profound truths of divine wisdom from the Bible, we are required to put in a lot more time & effort to gain it. In this way, both gold & God’s wisdom require patient searching, perseverance, tenacity, determination & above all time, to uncover & discover. A cursory glance at the Bible is like the prospector who quickly scans the ground & moves on: only the most obvious gold/wisdom can be discovered that way: literally, the stuff which lies on the surface. The prospector has to spend time thoroughly searching an area in order to satisfy him/herself that they have found all the gold there is to be found. If he/she were to merely glance at the ground & move on to a new area, then the gold buried just below the surface would not be found by them at all. In a similar way, we can quickly scan a bible passage & glean the most obvious information, wisdom or benefit from it, but if we are willing to spend more time in detailed reading, thought, analysis & above all meditation (*2) on that piece of scripture, then we might find a lot more “gold” within the passage. 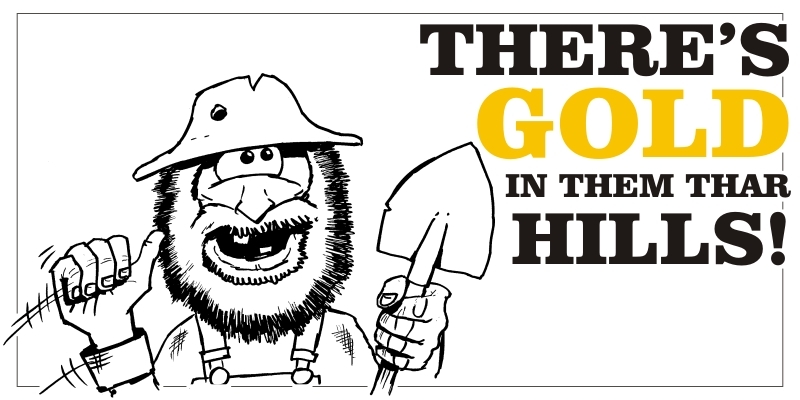 As I wrote earlier, this metaphor of “There’s gold in them thar hills!” doesn’t entirely work when applied to Bible reading, but there are significant parallels, & it serves a purpose of helping to explain why one “prospector” (Bible-reader) can read a passage & get little from it, whilst another “prospector” (Bible-reader) can read exactly the same passage & get enough wisdom, insight, faith-boost & encouragement to last a life time! “A private devotional act, consisting in deliberate reflection upon some spiritual truth or mystery, accompanied by mental prayer and by acts of the affection and of the will, especially formation of resolutions as to future conduct” (Cent. Dict., s.v.). Meditation is a duty that ought to be attended to by all who wish well to their spiritual interests. It should be deliberate, close, and continuous (Psalm 1:2; Psalm 119:97). The subjects that ought more especially to engage the Christian mind are: the works of creation (Psalm 19:1-6); the perfections of God (Deut. 32:4); the character, office, and work of Christ (Hebrews 12:2-3); the office and operations of the Holy Spirit (John 15-16); the dispensations of Providence (Psalm 97:1-2); the precepts and promises of God’s words (Psalm 119); the value, powers, and immortality of the soul (Mark 8:36); the depravity of our nature, and the grace of God in our salvation, etc.